The goal of any predictions is to warn about possible danger. Nostradamus, foreseeing future events, warns people of the world about the enormous destructive power of the coming global cataclysms. Nostradamus left a huge legacy, part of which he presented in numerous pictures-aquarelles. 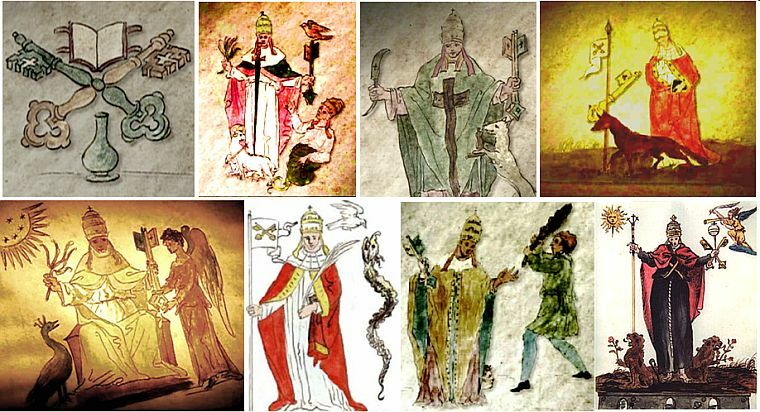 Despite the visible simplicity of information transmission by usual images – people, houses, trees, animals, plants, fishes, birds, priests, warriors – contents of the drawings was unclear. However, pictures-pictograms are easy to read by the two keys of «The Dictionary of symbols of consciousness», composed by Victoria Popova and Lidia Andrianova, the authors of this article. The Dictionary includes of about 300 symbols and their combinations. Pictures of Nostradamus through analog and digital symbols of consciousness reveal the events of the End of the cycle – the End of Time – the End of the World. They inform that the activation of tectonic plate’ movement will cause constantly amplifying global catastrophes that will show a wild uncontrollable power of nature incompatible with life of human and organic nature. The mission of the Woman in tiara – the salvation of mankind. Nostradamus informs that the only way of salvation given from the Above, will transmit the Woman who received the Instructions written in symbols of consciousness for mankind’ Transition to the safe Highest level of the material world in the kingdom of heaven. The Woman also received the keys for reading the Instruction. Nostradamus reports that this Woman – is the direct descendant of King David and in many pictures, revealing her mission, she is presented in the papal tiara and red cloak. These features of clothing are presented not all of a sudden, but are important attributes of information transfer. Why Nostradamus dressed this Woman in the papal clothes? The papal tiara is the arrow-pointer, that just to this Woman are given from the Above the two real keys to the kingdom of heaven. Tiara is a triple crown of the Pope, the high egg-shaped headdress, topped with a small cross and three crowns and two ribbons behind. All the elements of tiara are symbols of consciousness, and its decoding will be presented below. Tiara together with the keys of the kingdom of heaven are symbols of papal authority. However, before the global cataclysms beginning from the Above were transferred two real keys for the humanity Transition in the kingdom of heaven – on the Highest level of the material world. However, the Instructions given from the Above that explain how to get into the kingdom of heaven, are written in symbols of consciousness, and that’s why from the Above are given also the two keys for reading the Instructions. Consequently, just these keys are real, because by reading with them the Instructions mankind can get into the kingdom of heaven to escape from global cataclysms and continue life in the new cycle. That's why Nostradamus depicted tiara on the Woman’ head. The papal tiara is the arrow-pointer, that just to this Woman from the Above were given real keys to the kingdom of heaven. Information that the two keys and tiara as the arrow-pointer were given to the Woman from the Above, are clearly presented by two pictures of Nostradamus – 16 and 32. Thus, before global cataclysms’ beginning from the Above was made the replacement of the keys: two symbolic keys of the kingdom of heaven, which were given to St. Peter, were replaced by the two real keys. Symbolic keys were extremely important for the development of consciousness of civilization, because they guarantee the salvation of humanity at the time of mortal danger and constantly reminded about it for almost two millennia. Thus, humanity already long ago – nearly for two thousand years, had been warned that only two keys of the kingdom of heaven will save life of mankind. And just before global cataclysms’ beginning were given the Instruction from the Above, which indicated the only way for salvation and revealed in details the stages of the Transition. Emergence of the Woman with the real keys signifies the cataclysms’ beginning. In order to show that the Woman with the keys and the Instructions for the Transition appears simultaneously with the blows of the cataclysm of incredible power, Nostradamus depicts the Woman's body in the papal tiara grown together with the body of a snake – a symbol of global cataclysms. He depicts their bodies as a single entity, because the information for the Transition will be required just in this period. Thus, Nostradamus warns that the emergence of the Woman means the beginning of cataclysms. A similar picture but not Nostradamus, third from the left, is shown for more clear explanation, what means – the body of the snake grown together with the body of the Woman. In the picture 17, the first from the right Nostradamus informs that the Woman with tiara in the red cloak is protected from the attack by the Hand from the Above, because the Instructions for the Transition, which were transferred to her from the Above, are vitally important and are the only possibility for tied to the planet humanity to save from global cataclysms. No one and nowhere will be able to hide from amplifying cataclysms, because their goal is the destruction of the planet. Nostradamus: The Instructions for the Transition given from the Above mankind will receive in the written form. In the pictures below Nostradamus clearly transfers this information. Picture 16. Nostradamus informs that in certain time before the beginning of global cataclysms Angel transfers the keys of the kingdom of heaven to specially prepared person – the Woman in the tiara. These are the keys to the symbols of consciousness, in which are written the Instructions for the Transition of mankind in the next cycle of life. The Instructions will also be given from the Above to the same Woman to represent in a language understandable by the people of Earth. The keys are required because the symbols of consciousness, by which are transferred the Instructions, are based on some principles and concepts unknown to mankind, because they came from the Information world. These symbols are used by people with higher consciousness of extraterrestrial intelligence with the information vision that humanity has today only in the embryo and is manifested in the form of various phenomena of consciousness: clairvoyance, telekinesis, levitation and other. Picture 15. At once after the Woman was given from the Above the keys, she began to receive the dictating Instructions which were dictated to her. The Woman writes down the Instructions in the Book with the Quill and simultaneously decodes them with the help of given to her from the Above the keys of symbols of consciousness. About this informs the Quill in the right hand of the Woman, and the keys in her left hand. Thus, the Woman in the tiara had transformed the Instructions that were written in unclear to humanity language into accessible for understanding information. Picture 27. When the Instructions were received and written down, came the time of beginning of global cataclysms. About this reports to mankind the Trumpeting Angel of the apocalypse. Picture 21. The Woman in tiara, having received the detailed Instructions for the Transition of humanity, transferred the Quill into her left hand and pressed by it the Book with the Instructions. The left hand informs that the Instructions from the Above were given to mankind for salvation of life. In the right hand she took the flagpole with the evolving flag with the image of the keys as appeal to Transition of humanity into the kingdom of heaven for the salvation from global cataclysms. The right hand, in which is clamped the flag –is the hand of action. Let’s consider these pictures in more details. On the picture 16. The Angel handing the keys is clearly shown that the keys from the kingdom of heaven for the Transition on the Highest level of the material world, were given to the Woman with tiara from the Above. Five stars inside the sun, as well as five leaf branch in the hand of the Woman represent the fifth level of consciousness – the united consciousness, for which encourages the Woman. The Leaf Branch consists of two parts – three combined leaves forming a trident, and the two combined leaves – dual leaves. The Trident indicates the individual human consciousness, and also on the three previous levels of consciousness included in its cell. Dual leaves below indicate the united of consciousness. Location of stars – four together and one at the top informs about the necessity to change the fourth level of individual consciousness on the fifth level of the united consciousness. The Peacock at the feet of the Woman, on the one hand, indicates the Transition of humanity. On the other hand, Peacock represents sacred bird Phoenix, with which is connected the most important legend for humanity. According to the legend mankind, like the Phoenix, foreseeing his death in global cataclysms has to destroy body with the help of laser beam at the level of Crystal structures. At the same moment will occur the General resurrection, and the renewed humanity will arise again at the Highest level of the material world in the new cycle of life – the cycle of Correction. The picture is illuminated by the golden light of laser beam, which will cause the united consciousness of humanity, making this Transition. The Picture 15. The Woman in tiara holds in the same left hand the same keys that handed to her Angel, shown in the previous picture 16, for reading the Instructions for humanity’ Transition. In the right hand the Woman holds the Quill, by which she writes the Instructions, using the two keys, clamped in the left hand leading to the heart, in order to transfer them to humanity. All the elements of the picture – the cloak and the quill, and the keys are colored in green, which means life. Thus, the elements of the picture inform that the Woman receives from the Above and writes down the Information necessary to save life of humanity. On the quill and grooves of two keys are shown the same crosses, signifying the accessory the quill to keys, i.e. information, written by the quill, is immediately decoded by two keys of symbols of consciousness. At the front of the cloak on full-length is shows the huge cross that informs about the conditions of the Transition to the Highest level of the material world to the kingdom of heaven – it is necessary to destroy the body at the level of the Crystal structure. At the same time will happen the General resurrection of humanity at the Highest level of the material world, and humanity will continue living in the new cycle of life – in the cycle of Correction. Under the keys on hind legs is shown the white Dog, and her ear touches the keys. The Dog leans on the handle of the sword, which is placed in front of the Woman with the tip down. This means that the information transferred from the Above, in the form of two keys for decoding the Instructions, is guarded also from the Above. On the picture 27, the Trumpeting Angel of the apocalypse with a long white quill in his right hand reports the news from the Above. He warns humanity about the global cataclysms’ beginning, and also reports that the Woman in tiara has already received from the Above the way of salvation – the keys to read the Instructions written by symbols of consciousness for the Transition in the kingdom of heaven. Angel – is the messenger of God. A long white quill of the Angel means that humanity in details and in writing form will be presented received from the Above the Instructions for the Transition and information about these events. The picture 21. Serpent-cataclysm and the Instructions as a guide to action. On the picture is shown the moment of the cataclysms beginning which is depicted by the serpent. The Woman in tiara and red cloak already had written the Instructions received from the Above by the quill in the book that is seen under her clothing. So she transferred the quill from the right hand to the left hand. In the right hand as the appeal for action, the Woman holds the white flag as the appeal to people for truce and mutual understanding. On the flag are depicted the two keys of the kingdom of heaven, as the only way to escape from global cataclysms which are shown by the serpent standing upright. In addition, the keys on the flag in the right hand – the hand of action – mean that now the Instructions is a guide to action for the Transition of humanity. White Dove depicted above the quill is the symbol of the Holy Spirit. This way Nostradamus informs that the Instructions for the Transition of humanity and the two keys for their reading the Woman received from the Above and wrote them in the book. All the elements of the picture, depicting the relationship with the Holy Spirit, are shown in white – white quill and white flag. White Women's clothing means that she also receives the information from the Above. Left hand of the Woman leading to the heart, in which she holds the white quill and clasps the book means that in the basis of the Transition lays the golden rule of morality – love your neighbor as yourself. Thus, Nostradamus reports that Instructions for the Transition, transferred from the Above to the Woman depicted in the tiara will be presented to mankind in written form. Picture 27. The new knowledge about action of consciousness for the Transition. Nostradamus shows in his pictures how look real keys to the symbolism of consciousness for humanity's Transition into the kingdom of heaven for the continuation of life upon the occurrence of global cataclysms. He presented two codes on the heads of the keys in the picture 27. The purpose of the key is to open the lock, which closes something important or valuable from any strangers. That's why each key on the tooth-bit has special code with information' notches. On the keys represented by Nostradamus in the picture 27 each the teeth-bits are equal, smooth without any information’ notches, therefore, they do not have code – the keys are symbolical. Nostradamus explains that the mystery of the real keys that are given to mankind from the Above before beginning of global cataclysms of the planet’ destruction is not in the secret of tooth’ cipher. Keys provide humanity with new knowledge about work of consciousness that will allow making the Transition to a different level of the material world. The mystery of two Nostradamus keys reveals symbols of consciousness on their heads. They represent the main symbols of consciousness and the Principle of the Transition. Nostradamus: The key’ heads in the symbolism of consciousness. Crossed keys in the left hand of the Woman – are the keys to the kingdom of heaven – considered as symbol of liberation and the Transition to immortality. The head of one key represents an individual human cell and its structure. The head of other key reveals the Principle of the united consciousness and also the Law of the United Consciousness Action – the main law of the Transition. This head is represented by three crescents of united consciousness – one large and two small. Yellow color of the keys indicates that this information is given from the Above. The first key – the cell of individual consciousness – is a representation of a human being in the information world. Three small circles show the three previous levels of consciousness, included in the individual cell of human being, which reveal the structure of human cell. Five levels of consciousness in the universe. According to the symbolism of consciousness in the universe develop five levels of consciousness. The first level of consciousness corresponds to the inorganic nature of the stars – is shown in the picture by the sun. The second level of consciousness corresponds to the inorganic nature of the planet – it's the ground on which stands the Woman with her bare feet. The third level of consciousness corresponds to the organic nature of the planet, it is plants and animals, depicted on the picture as flowers and lions. The fourth level of consciousness corresponds to the individual consciousness of human being. As noted, human consciousness includes three previous levels of consciousness. The fifth level of consciousness is the united consciousness of humanity. This is the highest level of consciousness in the universe. Individual human cell and a trident – are symbols-analogues. These are analog and digital codes for deciphering pictograms with symbols of consciousness. The second Key – The Principle of the united consciousness: at unification of consciousness of two people – two individual cells with small brain areas – is formed one common cell of the united consciousness with an expanded brain area. At the unification of consciousness of people in each cell happens the shift of the brain area from the center to the border, and is formed the crescent of the united consciousness. Thus, each of the two small crescents in the images of the second key shows a shift of the brain area in each individual cell of human at the unification of consciousness. Big crescent represents common shift in the brain areas at the unification of consciousness of two people. The principle of the united consciousness reveals the real action that occurs in the material world as a result of unification of consciousness. This action arises always and is formulated by the Law of the Action of the United Consciousness. The Law of the Action of the United Consciousness. Unification of consciousness causes an action. This action does not obey laws of the material world, because it is a result of the rearrangements occurring in the information cell. The type of rearrangements is determined by the chosen goal. The unification of consciousness means the union of brain areas of individual cells for the exchange of information. Occurring in them rearrangements on the Information level in accordance with the intended purpose are causing real physical action in the material world in accordance with the intended purpose. That is why the action in the material world appears suddenly. It can hit, knock down or even lift into the air. Extraterrestrials make flights through the universe and overcome hundreds of millions of light years, also using the action of the united consciousness. This is called teleportation. With the help of the action they transform their body – transfer it to different sub-level of parallel worlds, making it more holographic. The Transition that we have to make on the Highest level of the material world is also based on the action of the united consciousness of humanity, associated with a common goal. Action of incredible power, caused by the united consciousness of civilization, will arise in the form of the laser beam, which will destroy the body at the level of Crystal structures. At the same time the General resurrection of humanity at the Highest level of the material world will happen. The two keys to the symbolism of consciousness are real and two keys – golden and silver of the kingdom of heaven – are symbolic. They were handed over to the Apostle Peter, the founder of the papacy and the first Pope. Ceremonial baton of transferring of the keys for many centuries, as well as their image on the arms of all of the Popes, constantly reminded mankind that at the time of the mortal danger for civilization of Earth will be opened the way to the Kingdom of Heaven for salvation. By these two keys humanity will to unlock its gates. Thus, for nearly two thousand years ago, mankind has been warned that only two keys will help humanity to escape at the time of mortal danger. And now, at the eve of the beginning of global cataclysms of the planet’ destruction of incredible force that will erase from the face of the earth not only humanity, but also the whole organic nature, HUMANITY RECEIVED FROM THE ABOVE THE REAL KEYS FOR THE TRANSITION on another safe Highest level of the material world. So, from the Above came salvation in the form of two keys that allowed to read and understand the Instructions for mankind’ Transition on the Highest safe level of the material world – in the Kingdom of Heaven, where will begin the new cycle of life and humanity will gain immortality. Mankind has to necessarily be informed about the replacement of the keys from the Above – symbolic on real. These two keys to the symbolism of consciousness allowed reading and understanding the Instructions for the Transition, that's why they are real. However, about the replacement of keys do not know yet all the people of the Earth and they have to be informed. Mankind has detailed instructions for the Transition. Humanity is now at a critical juncture - all of a sudden unsuspecting humanity will undergo natural blow of incredible power. Before the start of the disaster with severe consequences of arising of high levels of radiation on the planet, humanity must firmly know that now all of us have two real keys that can really open the kingdom of heaven for continuation of life. The inverted cross of St. Peter depicted on the beards of the keys of the Papacy and of Nostradamus keys is associated with the decision of the Apostle Peter, to be crucified upside down. Inverted cross of St. Peter conveys important information. He pays attention of humanity on necessity to overcome the main obstacles for the Transition -to turn over the individual consciousness of wars and hatred to the united consciousness of understanding and love. At the heart of the Transition has to lay the golden principle of morality – love your neighbor as yourself. Two keys in Nostradamus’ pictures. Two keys from the kingdom of heaven, as the only possibility for salvation of humanity at the time of occurrence of grave danger of global cataclysms' beginning are shown in many drawings of Nostradamus. Let's consider two drawing of Nostradamus: picture «The peaks of war» and picture 4. «Handshakes of the Transition». These pictures show not keys but keyholes, in which two keys are to be inserted in order to enter the kingdom of heaven – on the Highest level of the material world. Today humanity is living in hate, strives and wars. Green color of the clothes of people with peaks shows that it is the story of life and its basis. All elements of the structure and even the sky are painted in brown. This way is shown that the picture depicts events in the life of humanity at the level of the Crystal structures. The central part of the building in the picture resembles St. Peter's Basilica in the Vatican - the ceremonial center of the Roman Catholic Church, where is placed a permanent residence of the Pope, who has two keys of the kingdom of heaven. Mankind has long been aware of the two keys of the kingdom of heaven, which were given to the Apostle Peter. The presence of the keys, shown by the two keyholes on the entrance to the construction. These keys are the symbols of the Papacy, which is shown in all its heraldry - emblem, coat of arms, seals, coats of arms on the Popes, on the floor of the entrance to the Cathedral of St. Peter. Thus, humanity, on the one hand, has the keys of the kingdom of heaven, but on the other hand, does not understand their true meaning. Therefore, humanity has deep individual consciousness marked by hate, wars and lack of compassion. In anticipation of global cataclysms two symbolic keys that humanity has for two millennia, have been replaced from the Above by two real keys. These two keys were given for reading the Instructions written in symbols of consciousness, for the Transition of humanity to a Highest level of the material world – into the kingdom of heaven. The presence of two keys is shown by two keyholes at the enter of the Palace of the kingdom of heaven. Today, the palace is empty, because humanity is currently living at the level of Crystal structures. Having read and understood the Instructions, humanity has learned that for the Transition it is necessary to unite consciousness. This is shown in the picture by three pairs of hands, preparing for the handshake. On the one hand, three hands at each side indicate the three previous level of consciousness within the human individual cell. On the other hand, are shown six people preparing for the handshake by three on each side of the superstructure. Five fingers on each hand represent the fifth level of consciousness is the unified consciousness. The picture shows that the superstructure divides the hands and prevents the handshake, i.e. unification of consciousness. The superstructure shows individual consciousness and its values. However, find out about the Transition, the individual consciousness is rebuilt and the process of unification of consciousness begins. About this informs the superstructures. Thus, two small circles on the roof of the superstructure represent small brain areas of two individual cells - two people. Between them there are four sections of the roof of the superstructure. Number four points to the fourth level of consciousness - the individual consciousness. Expansion of the roof represents the expansion of the brain area at the transfer from individual consciousness, which represents two small circles on the roof – to the united consciousness, which extended brain area represents a square cross-section, on which is put the roof. Three rectangles under the roof on each side of the superstructure show three previous levels of consciousness, entering into human cell. Therefore, the elements of the superstructure inform about the unification of consciousness of two people. The Highest level of the material world, i.e. the kingdom of heaven, is represented by the Palace and the heavens, colored in blue. Brown color of the ground shows the level of Crystal structures. The Transition to the Highest level depicts the Gangways with blue railings, leaning against the door of the palace of the kingdom of heaven. Gangways are shown in the form of two long rectangles that represent shifts of brain areas in individual cells at the unification of two people consciousness. The oval shape of openings in both pictures is the image of the symbol «oval of the Transition», which is the result of deep combining of consciousness of people and the imposition of brain areas of their cells. Thus, the pictures inform that for the Transition in the kingdom of heaven is necessary not only to change the mode of consciousness from individual to united, but also to change the basis of the relationship between people – from hate to understanding. Information about the Transition and the real keys, given from the Above to the Woman with tiara, will be met by many people very aggressively, oppose adamantly, with hostile reception. Sharp emotions of people who do not want to unite consciousness for the Transition and part with private property, Nostradamus has expressed by severe stroke of club, which holds the man in green dress, reflecting the reaction of these people. However, the events of the nearest future – natural catastrophes of incredible strength – will quickly convince mankind that the way of salvation of civilization given from the Above and transmitted by the Woman in tiara is the only one. About this informs a man's head at the bottom, looking out from the skirt of the Woman. Two keys that the Woman holds in her right hand, are given for reading the Instructions written by symbols of consciousness for humanity's Transition to the Highest level of the material world – the kingdom of heaven. The cudgel represents a profound individual human consciousness. Three outgrowths depict three previous levels of consciousness, entering into cell of individual consciousness of a human. Brain area of human cell is shown by the round top. The Man with two hands clutching a cudgel informs that many people strongly keep individual consciousness and its values. Green color of the man’ clothing depicts the daily life of the individual consciousness, which is accompanied with aggression and hate. However, the events will show that, for the continuation of life it is necessary to change the basis of consciousness – from individual to united. Long vertical clasp with two rows of many buttons inform about the association of consciousness necessary for the transition. Numerous buttons represent the brain areas of individual cells of the people of earth, united consciousness. Five fingers wide opened on the left hand of the Woman, leading to the heart, represent the fifth level of consciousness of mankind – united consciousness. The left hand informs that the basis of unification of consciousness should lay on the golden principle of morality – love your neighbor as yourself. So is expressed information of the Woman in a tiara suggesting to the man in green clothes to unite consciousness for the Transition. This means that it is necessary to turn over consciousness. The emblem of the Papacy is three-level tiara and two keys. Three-level tiara is composed of many elements of the symbolism of consciousness. However, most importantly, that tiara which is worn on the head, informs about the expansion of the cell’ brain area under unification of consciousness and, as a result of this, dematerialization of a body. The Woman with tiara on head is depicted in many drawings of Nostradamus. Thus, Nostradamus repeatedly pays attention to the great mission of the Woman – to transmit to mankind, given from the Above, the Instructions for the Transition to a safe Highest level of the material world into the kingdom of heaven through the united consciousness, as the salvation from cataclysms. So, tiara, shown on the Woman’s head, is the arrow-pointer of the person to whom were given from the Above two keys, and also the Instructions for the Transition. Tiara is a triple crown of the Pope, the high ovoid shape headdress, topped with a small cross and three crowns, and also two ribbons behind. All elements of tiara are symbols of consciousness. The three levels of the tiara indicate the three previous levels of consciousness, entering into an individual cell of each human. On each of the three levels of tiara is repeated the same information. In addition, the same information is interleaved with the image of an individual cell of a human and patterns of diamonds, also depicting the fourth level of the individual human consciousness. The connecting lines form the expanded brain areas of the cells and inform about the unification of consciousness and the transfer from individual consciousness to the united. Other elements represent a pointed oval of the Transition. Thus, the ornament of three-tiered crown indicates on changing the mode of individual consciousness on the united and reveals the basic principles of united consciousness. A small ball or a ring at the top of the tiara, on which is usually set a small cross, depicts a small brain’ area of an individual cell. The cross mounted on top once again underlines the fourth level of individual human consciousness. Expanding of tiara to the bottom depicts the expansion of a brain’ area of a cell at the change of individual regime of consciousness to the united. Ovoid shape of tiara – depicts a pointed oval of the Transition, which occurs under a deep unification of consciousness, which is based on the golden rule of morality – love your neighbor as yourself, underlying the necessary relationships of people for the Transition. Two long ribbons behind depict a shift and expansion of the brain area that occur in every human cell, under unification of consciousness of two people. Thus, expanded area of the brain of the united cell represents the bottom diameter of tiara, to which ribbons are attached. Expansion of ribbons to the bottom depicts the expansion of the brain area under unification of consciousness. A fringe at the end of each ribbon represents the unification of the consciousness of huge number of people, in the cell of each of whom happens the shift of the brain area, represented by a separate strand of a fringe. Horizontal row of rectangles, which is sometimes installed in front of a fringe, also underlines the fourth level of individual consciousness of people uniting consciousness. In this case, the expanded brain area of the united cell represents the width of the ribbon, to which is sewn a fringe. Mitre. The shape of another headdress of the Pope – mitre – also depicts the symbol of a pointed oval of the Transition, and two tops of mitre inform that this oval arises under unification of consciousness of two people. The expansion shape of mitre represents the expansion of a brain area of human cell under unification of consciousness. Trumpeting Angel of the Apocalypse not only warns mankind about danger of global cataclysms’ beginning, but also reports that there is a way of salvation – it is the Transition, which has to be made on another safe level of the material world. Multi- layers structure of the material world. The picture discloses a multi-layering of the material world and presents two levels. The level of the Crystal structures where today humanity lives is emphasized by a low pedestal with earth and grass, on which stands a barefoot Woman in tiara. The Highest level of the material world is designated by a cloud, from which is trumpeting to us Angel of the apocalypse. Trumpeting Angel of the Apocalypse warns humanity of the mortal danger of global cataclysms’ onset. Trumpeting Angel of the Apocalypse is presented in many paintings about the apocalypse and the Day of Judgment. Yellow color of clothes and trumpet of Angel indicate that he is hurrying to announce humanity about the information transmitted from the Above. Blue wings. The blue color of Angel’ wings inform that the main content of his message – about the Transition of humanity to the Highest safe level of the material world for the salvation from cataclysms. This underlines also blue color of clouds on which stands an Angel. White long quillin the right hand of Angel means that the Instructions for the Transition will be written and transmitted to humanity in details in written form. Long quill reports that the Instructions will be written for a long time, because they will explain in details all the elements of the Transition. Long pipe of Angel. Expanding shape of Angel’ pipe indicates adherence to the decision about the Transition of more and more people. Long pipe of an Angel depicts a shift of brain areas in all individual cells of a huge number of people – of all civilization, that made the decision about the Transition, and, as a result, united consciousness. The Woman in tiara. A major figure in the drawing is the Woman in tiara in a long black robe and red cloak draped over her. Black and red clothes mean mourning due to the death of huge number of people as a result of cataclysm. Tiaraon the Woman’ head informs that she has already received from the Above the Instructions for the Transition and continuation of life. That is why the Woman holds two keys in the hand. They are given to her from the Above for reading symbols of consciousness, in which are written the Instructions. She holds the keys in the left hand, leading to heart, thus informing that it is vitally important information. The content of the Instructions disclose all elements of the picture – two keys and a high pole in the hands of the Woman, as well as two lions at her feet and the image of the sun. Zigzags on the tiara. Details of the tiara in yellow color, informing about unification of consciousness, mean that this information is given from the Above. Multi-level tiara as a crown and symbolic of consciousness on it tells about formation of the oval of dematerialization and the Transition through the united consciousness. On the necessity of unification of consciousness indicate the central and upper patterns of the crown of zigzag shape. Each tooth means unification of the two brain areas that are shifted to the border of the cell under the unification of consciousness. Various sizes of teeth – large and small inform about the speed of formation of the united consciousness of civilization as a result of accession to the decision of the Transition an increasing number of people. Thus, small zigzag marks the beginning of unification of consciousness, when consciousness jointed only a small number of people and the rate of expansion of the brain area of the united cell is low. The large size of the zigzag' teeth show that the brain area of the united cell is expanding very rapidly, therefore, a huge number of people constantly joins to the united consciousness. The pictogram-crown is read from top to bottom, i.e. at the top of the crown the teeth are small, and at the bottom – large. Consequently, the picture shows that at first unification of consciousness goes slowly, but then, much faster. From this point of view, the head on which the tiara is dressed, represents the cell of the united consciousness of civilization. Crown with a face – a symbol of dematerialization and the Transition. Crown with a face form the shape of an oval. So is shown a symbol of oval of dematerialization and the Transition. The decoration on the top of the crown consists of two quarters of the two circles and the oval on the top. The symbol of oval of dematerialization and the Transition is formed as a result of the overlaying of two brain areas of individual cells. This way is shown that for the Transition is necessary a deep unification of consciousness of all people. On the other hand, the Crown tells about changing of the mode of individual consciousness on the united and the formation of the oval of the Transition, which depicts the face with the crown, as well as a decoration on its top. Woman's eyes are shown as crosses, obtained by overlaying of horizontal and vertical lines. Such arrangement indicates the fourth level of individual consciousness and informs that each human usually has an individual mode of consciousness. However, two eyes represent the united consciousness. The cross on the chest. Yellow diagonal cross on the breast of the Woman (not vertical-horizontal) informs about the necessity to destroy the body for the Transition, otherwise humanity will be destroyed by global cataclysms. Yellow cross indicates that this information is given from the Above. The long dashed line on the clothing.The lower part of the long dress the Woman is separated from the belt by vertical light line on the two elongated rectangles. The four sides of each rectangle represent the fourth level of consciousness. On the other hand, the squares depict individual cells, and rectangles represent the shift of the brain areas under unification of consciousness. Very elongated rectangles on the Woman’ clothing inform about the shift of the brain areas in the cells of many people, i.e. the whole civilization of Earth has to unite consciousness. This emphasizes the dash light vertical line on the Woman's clothes, which separate the rectangles. It consists of repetitive small rectangles representing the shifts of the brain area in the cells of people, who joined consciousness. The bare feet of the Woman, standing on the ground, indicate the habitat of mankind. It is shown that we are living on earth at one of the three main levels of the parallel worlds of the material world, namely, on the level of Crystal structures. This level is indicated by the brown earth and grass. On the other hand, the bare feet of the Woman, as well as many other elements of her body and clothing, inform about the united consciousness. Five toes on each foot means the fifth level of consciousness – the united consciousness. Two feet with five fingers on each portray repeated association of consciousness. This information indicates that mankind has to unite consciousness and make the Transition to another safe level of the material world in order not to be annihilated by global cataclysms. The tall figure of the Woman.The figure of the Woman is very elongated and high. The tiara on the Woman’ head is displayed at the level of the Sun and of the trumpeting Angel of the apocalypse. The Pole in her right hand is also very long. Since all the elements of the Woman – and the clothes, and bare feet, and tiara, and a long pole inform about the association of consciousness, such a hyper-elongated figure means the repetition of elements of the united consciousness of many people, that is, informs about unification of consciousness of humanity. On the other hand, a small head of the Woman depicts a brain area of individual cell, at the time, as her very long body means a shift in the brain area of cells of all humanity. Tiara with details of yellow color means that the Woman receives the information from the Above. Consequently, humanity, knowing information from the Above about beginning of global cataclysms, and the only way of salvation, will make the decision about the unification of consciousness for the Transition. This decision will cause a shift of the brain areas in all individual cells of humanity, which portrays a very long body of the Women. Platform-pedestal–the Woman is standing on decorated basis that presents the level of the Crystal structures of the material world. Her bare foot stands on the horizontal surface of the pedestal depicting a small piece of land covered with grass. Thus, Nostradamus reports that the land on which humanity lives – this is just a platform – a small island. Symbolic of consciousness on the side surface of the pedestal. On the side surface of the pedestal is presented the symbolism that reveals the law of the united consciousness - the main law of the Transition to the Highest level of the material world for the continuation of life. Horizontal surface impends over the vertical surface as narrow ledge. Directly beneath it in different places of the side surface of the pedestal are shown four small circles with a dot in the center of each. This way is depicted a cell of the individual human consciousness (red arrows). The number four, on the one hand mean the fourth level of human' consciousness, i.e. this picture is about people. On the other hand, the number four means two pairs of people uniting consciousness. Under consciousness’ unification the brain areas of cells expand. Small through-openings on the pedestal depict the crescents of the united consciousness. Crescents inform that there was a shift of brain area in each cell as a result of unification of consciousness between two people. From the left side of the first through-opening from the right directly below the cell of the individual consciousness, is shown a strange figure that consists of three elements. This figure presents the law of the united consciousness. This law states: under unification of two individual cells with a small area of brain is formed one united cell with the expanded area of the brain. The figure shows this law. Three through-openings. On the side surface of the platform are placed three small through-openings which show the extent of flooding in the three cataclysms. Three rising water levels, which are visible through the through openings platform, informs that natural disasters will all grow until it will cover the entire planet. Three openings with different levels of water, on the one hand, present the three preliminary cataclysms with increasing power associated with the water. On the other hand, three through-openings integrally characterize the possibility of mankind to live on the planet. As the figure shows, the water level in the third opening, rising to the top, means that humanity can no longer live on the planet. Increased water means not only the flooding. It can be an incredible height of tsunami, moving across the planet. Trumpeting Angel, warning humanity about the mortal danger, is depicted on the right before the first opening, through which can be seen the lowest water level. Through the second opening can be seen that the water level has risen above the half. Just over the second opening stands the Woman with the keys to reading the Instructions, urging humanity to the Transition. The Woman' left foot, leading to the heart, stands before the second opening, underlying that before the onset of the second cataclysm humanity has unite consciousness for the Transition. After this catastrophe it will be already too late to make the Transition. The third opening, completely closed by risen water, means that the cataclysms of incredible power cover vast areas, and mankind is destroyed. Thus, Nostradamus informs that if humanity does not make the Transition in time, it will be destroyed in the result of global cataclysms that will never stop. Two Lions at the feet of the Woman. Near two bare feet of the Women on both sides are depicted two Lions. The number two represent the principle of the united consciousness, which lies at the heart of the Transition, because number two means the unification of two people’ consciousness. However, in this case, the position of the Lions is different. Let’s consider in details the information they convey. Flowers in the paws of the Lions. In the paw of each Lion are depicted pink flowers on long stems. Moreover, the Lion sitting on the Woman’ right, holds only one flower. One Lion and one flower show the individual consciousness. The Leo, seated at the left, is holding three flowers – bud, opening flower and fully blossomed. Three flowers depict the three previous levels of consciousness included in the individual human cell. In this case, the bud shows the level of consciousness of stars, the opening flower presents the level of consciousness of inorganic nature, and fully opened flower on the longest stem depicts the level of consciousness of an organic nature, which comprised the Lion. The same information about three previous levels of consciousness, which enter into each individual cell, is repeated by three crosses on the end of a long pole in the hand of the Woman and three circles on the head of the key which depict the structure of individual human cell. Thus, both Lions talk about the individual human consciousness, but only from different sides – one Lion represents an individual cell, and the other – reveals the structure of this cell. The position of Lions. This information emphasizes also the position of the Lions. Thus, the Lion on his right hand of the Woman, depicting the individual consciousness, is sitting separately and independently, proudly holding up his head. He is shown completely with the tail. To the left from the Woman is shown the Lion with roses in paw. This Lion reveals the structure of individual human cell and as a result he is half-hidden behind the Woman showing this way the belonging and dependence. The body of this Lion is shown only partly, he seems looks out from the Woman's clothes. It emphasized that the third level of consciousness - consciousness of organic nature: plants and animals - are included in the human cell as one of the previous levels of consciousness. Pair of leaves. The leaves on long stems of flowers-roses are depicted in pairs. This informs that for unification of consciousness are required two people. The same information is transmitted by two Lions. Lion is an incredible amplifier. Lion is the king of beasts, possessing incredible strength. Through the image of the Lion the artist emphasizes of incredible amplifying of the action of the united consciousness of humanity required for the Transition. Through the image of the Lion is shown that for mankind is not enough to simultaneously form the united consciousness for the Transition. Humanity also has to fulfill special conditions for an incredible amplifying of the action which will be caused by the united consciousness. Only in this case, the Transition will be successful. Thus, the image of the Lion represents an incredible amplifying of the laser beam of homogeneous-resonant structure of the united consciousness of humanity. It can only be created on the base of the golden rule of morality: 'Love your neighbor as yourself. The implementation of this condition means a revolution of consciousness which is indicated by the inverted cross of Peter. High pole. The Woman in her right hand holds a long pole, which rests on the head of the Lion. The pole transmits a multilevel information. The pole is painted in gold color, which means that the information it transmits, is received from the Above. Fingers and stripes on the pole. Fingers of the Woman’ right hand and dark parallel stripes at the top of the pole reveal the main Principle of the united consciousness: under unification of consciousness of two people – two individual cells with small areas of the brain is formed one cell of the united consciousness with an expanded area of the brain. Thus, on the pole are shown alternation of two narrow dark stripes with a single wide stripe. In this case, each narrow strip shows the brain area of individual cell of one person. Since the stripe is not a square, but is a rectangle, it depicts a shift of the brain area in the individual cell, under unification of consciousness of people. Two parallel narrow stripes represent the unification of two people' consciousness. Wide strip shows already the result of unification of consciousness – an extended area of the brain of the united cell. The same information transmit two unclenched and two clamped fingers, covering the pole. Thus, one finger depicts a narrow rectangle, i.e. it represents the shift of a small brain area in the cell of one human. Two clamped fingers nearby depict the expanded brain area of the united cell. Besides, two unclenched fingers and two clamped inform that unification of consciousness of people happens by pairs. There is another perspective of the presented information. Three fingers and three crosses on the pole. Besides the two clamped fingers one bigger finger is clamped. They of them cover the pole. Thus, the pole cover, on the one hand, two fingers, while on the other – three fingers. In addition, on the upper end of the pole are put three crosses. They are attached to the last narrow horizontal strip, representing a brain’ area of an individual cell. Consequently, it emphasizes that the three crosses characterize individual cell. So, on the one hand, they represent a trident, which means individual human consciousness. Trident – is an analogue of information cell. On the other hand, number «three» indicated on three previous level of consciousness included in the individual human cell. Therefore, the pole represents a brain area of the cell of individual human consciousness. That's why a long pole rests on the head of the Lion with a single rose in his paw. On the other hand, the pole is an image of a rectangle and means the shift of a brain’ area in individual cell under unification of consciousness. The huge height of the pole means the multiple repetition of this information. Therefore,at first consciousness unite two people to whom constantly joins a growing number of people up to the united consciousness of Earth civilization. The sun. The sun depicted on the picture consists of a large circle with a human face, to which are attached around the circumference by eight wavy lines and long, narrow peaks. The image of the Sun at the level of the pipe of Angel of Apocalypse means that the onset of global cataclysms is connected with the particular state of the Sun. Eight elongated triangles. Image of the sun consists of eight elongated triangles. Each triangle represents the shift and expansion of the brain area of the cells at the transfer from individual consciousness to the united and joining of a growing number of people. Four mutually-perpendicular triangles informed that united consciousness was formed by two pairs of people. Elongation depicts the shift of the brain’ area in the individual cell and means that more and more people joins to the unification of consciousness. In addition, on the picture are shown two images rotated relatively one to another at some angle. This way is shown twice more people that have already joined the united consciousness. The disc of the sun with a human face depicts a huge area of the brain of the united cell of civilization. Thus, the rays shown in the form of two figures consisting of four elongated triangles arranged perpendicular to each other, inform about the gradual unification of consciousness beginning from the four pairs of people and up to the entire Earth's civilization. So, the solar disk represents the brain area of the united cell of Earth civilization. On the other hand, each of the elongated triangles reminds long sword’ blade shown in another picture of Nostradamus. It presents the action that had caused the united consciousness of civilization in the form of a laser beam which is required for the Transition on the safe Highest level of the material world. Eight wavy lines.From a disk of the Sun depart also eight wavy lines which remind zigzags. The zigzag, in turn, represents the process of association of consciousness and joining of the growing number of people. The sun will cause the onset disasters. Wavy lines, on the other hand, resemble a snake’ writhing body. From this viewpoint, they inform that the processes on the sun including will be the cause of the global cataclysms’ beginning. In the symbolism of consciousness a snake is the symbol of global cataclysms, and long sword blade means the laser rays, caused by the action of the united consciousness of Earth' humanity. Thus, the image of the Sun at the same time warns about the occurrence of global cataclysms, and shows the way out for the continuation of life - to create laser beams for the Transition to the safe Highest level of the material world through the united consciousness of humanity. Two keys. The Woman in the left hand is holding two golden keys. Golden color of the keys means that the most important information for humanity, which they reveal is transferred from the Above. The keys looks like the classical skeleton keys with one tooth-bit consisting of a flat head, cylindrical shaft and a tooth-bit. However, they are made without informational notches, which are usually applied to the tooth in the form of flat platforms of different heights. This shows that the keys are not for unlocking of doors. They are only just informational. The keys’ teeth. Teeth of both keys are identical and formed as quadrangles. Number four means the fourth level of consciousness. So, the keys transmit information about a human being. The square represents an individual human cell. Each of the two elongated rectangles represents a cell of the united consciousness, i.e. it is an individual human cell with a shifted brain’ area. This shift of brain’ area occurred as a result of unification of consciousness with another person. In the symbols of consciousness this process looks like the following. In the center of the rectangle is shown the cross. The lines that form it are parallel to the sides. This signifies the belonging of this information to a human, i.e. it is shown that this is not just a normal rectangle, but information cell of people with a shifted brain’ area as a result of unification of consciousness. In this case, the cross represents the fourth level of consciousness. Thus, the teeth reveal to us the mystery of keys. It turns out that the keys transmit to mankind of Earth not only information about human, but also talk about the united consciousness of people. In more details this information is revealed already by other parts of keys. Let's consider them. Long shafts of keys, the same as teeth, inform that in individual cell happened the shift of the brain area due to association with consciousness of other human. The long length of the key' shafts indicates on a large number of people united consciousness for the continuation of life. Thus, the shafts of the keys also pay our attention on the unification of consciousness. Cross-shaped arrangement of keys. Keys are superposed on each other so that they form a diagonal cross. Diagonal cross – is a cross of destruction. A similar cross is presented also on a Woman's chest. Both crosses mean the destruction of the fourth level of consciousness – the individual human consciousness – in global cataclysms. In contrast to them, vertical-horizontal crosses – on the Big Ball and both keys – transmit information about the fourth level of consciousness, urging humanity to change the individual mode of consciousness on the united. The Big Ball. Information about the association of consciousness of civilization for the Transition complements the Big Ball, mounted on the pole, clamped in hand of the Woman with the keys. Two parallel lines located on equidistant from the horizontal axis of symmetry, divide the Ball into two parts – the upper and lower. On the one hand, these two equal parts into which the Big ball is divided, reveal the Law of the United consciousness – at unification of the two individual cells is formed one cell of the united consciousness with an expanded brain’ area. On the other hand, the upper part of the Big Ball presents an image of the crescent of the united consciousness. The lower part consists, in turn, of two elements – it is an oval of the Transition is and crescent of the united consciousness. The crescent forms the lower part of the figure, and the oval of the Transition – the top part. Thus, the components of the Big Ball tell about the unification of consciousness. In addition, the number two – two lines, two parts – reveals the process of unification of consciousness, which requires two people. A small cross on the Big Ball. On the top of the Big Ball is shown a small cross formed by the horizontal and vertical lines. Small circles at its ends represent small brain areas of individual cells. Four these circles indicate the fourth level of individual human consciousness. Thus, the Small Cross and Big Ball inform, that the fourth level of the individual human consciousness has to transfer to the united consciousness of humanity, which depicts the Big Ball. On the other hand, the four circles which are connected pair wise with each other as well as collectively depict four people uniting consciousness. This small cross on the Big Ball is located directly below the pipe of Angel who warns of the deadly danger of global cataclysms and points to the only way out - to make the Transition to the Highest level of the material world through the united consciousness. The combination of elements touching each other – Trumpet of Angel, Small Cross and Big Ball, each of which relates the association of consciousness, reports that for the preservation of life, humanity must change the mode of consciousness from individual to the united. Conclusion. Thus, the Trumpeting Angel not only warns humanity about the occurrence of global cataclysms, but also points out the way for the continuation of life. This information about the Transition had reported the Woman in the red dress. The tiara on her head means that she has already received from the Above the Instructions for the Transition, written in symbols of consciousness and the two keys for their reading. The picture reflects the joy of the Highest level due to acquisition of mankind, which is presented by the Woman in the blue dress, and a deep sadness of the level of the Crystal structures about the great loss of humanity, shown by the Woman in the brown dress. The Woman in the red dress. In the center is shown the Woman in the red dress with the papal tiara on her head. Red color of clothing means the information world, and the papal tiara informs that the Woman has the two keys to the kingdom of heaven. This Woman informs to the other two Women about the Transition of mankind from the level of the Crystal structure to the Highest level of the material world into the kingdom of heaven. She has already received from the Above the Instructions for the Transition, written in symbols of consciousness, together with two keys to read them. That’s why she is staying between the two Women in blue and brown dresses, representing these both levels of the material world. Three-tier crown – tiara of the Woman and her hands folded together mean that the Woman is telling about a new for humanity the highest type of consciousness – the united consciousness of civilization, which is based on a deep understanding of all people of the world according to the golden rule of morality – Love your neighbor as yourself. Her whole image is presented by symbols of consciousness. Small ball on top of the tiara – three-tier crown – represents a cell of individual consciousness and its structure – three levels of consciousness, included into human cell. Expanding to the center the shape of the tiara informs about the expansion of the brain area of the cell under changing of the individual mode of consciousness to the united. Two ribbons going down on the shoulders represent the shift of the brain areas in each of the two individual cells under unification of consciousness. Tiara together with the Woman’ face depict the oval of the Transition through the body’ destruction. Her two joined hands, each of which has five fingers, represent the Principle of united consciousness. Number five means the fifth highest level of consciousness – the united consciousness of humanity. Gold color, by which are covered the three levels of the tiara, a small circle on top of it, as well as two ribbons going down from the two sides, means that information about all these elements that reveal the structure of human cell, and the basis of individual and united consciousness are receive from Above. The Woman in the blue dress with a crown on her head depicts the Highest level of the material world on which humanity has to make the Transition. This Woman is happy. The joy of the event is expressed in the applause of her clapping hands, lifted up a happy face. Two of her hands folded together, each of which has five fingers, represent the basis of the Transition – united consciousness of civilization. Five fingers represent the fifth level of consciousness corresponding to the united consciousness of humanity. This is the highest level of consciousness that humanity has to form for the Transition. The crown on her head indicates that the Highest level of the material world is crowned, it is the kingdom of heaven. In the basis of a single-level crown is a broad gold ring depicting the extended brain’ area of the united cell. TheWoman in the brown dress of earth color depicts the level of the Crystal structures, where today lives humanity. The deep bitterness of loss of the level of the Crystal structures, which have to leave humanity, depicts lowered head and a sad expression on her face. Twoarranged insidehands, each with five fingers depict still not formed united consciousness. Number five means the united consciousness. Fingers. The fingers on both hands of the Woman are put alike. They tell about the structure of human cell, as well as about individual cell and united consciousness' cell. The bottom three fingers folded together represent the three previous levels of consciousness that are part of a cell of the fourth level of human consciousness. Together with the fourth finger raised a little bit up, these three fingers folded together, represent the fourth level of consciousness corresponding to the individual consciousness of humanity. The upper thumb of her right hand, representing the united consciousness of humanity, is almost invisible against the background of clothing. This means that in the basis of human life on the planet lay the principles of individual consciousness. However, on her left arm, located on the side of the heart, the upper finger depicting the united consciousness of humanity is perfectly visible. Therefore, in the base of the united consciousness of humanity for the Transition have to be love and understanding. The gold ring over the Woman's head. Like a halo over the head of the Women, as the crown of the future victory of the Transition is depicted a gold ring, representing the extended brain area of the cell of the united consciousness of humanity. This way is shown a goal which humanity has to reach for the Transition to the next cycle of life. On the other hand, this same ring shows another symbol of consciousness – the oval of the Transition. 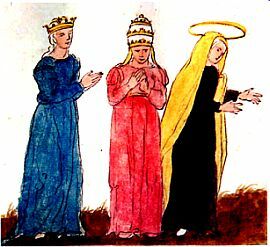 Gold color of the ring over her head, and also long cloak up to the ground, covering her head and falling on the clothes, means that information about the Transition was received from the Above. This information deeply saddened the Woman that also represents the humanity of Earth.The long cloak, which covers the image of the Woman from head to toe, means that the information from the Above about the Transition is an extremely important for humanity. White sock on the foot of the Woman in the brown dress. One leg of the Woman in the brown dress is standing on the earth, and merges with the brown color of earth. The other leg – in a white sock – means that humanity should disappear from the level of the Crystal structures. White sock depicts emptiness, showing thereby that humanity is on the ground only by one leg. Long clothing of all Women portrays the long life of humanity in both cycles - both at the level of Crystal structures and at the Highest level of the material world. 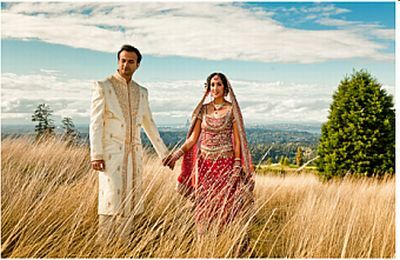 The plume of elongation on the left on the skirt of the blue dress. However, the skirt of blue dress has a small plume on the left, i.e. it is longer than the others. This shows that human life on the Highest levels in the cycle of Correction will be longer than in the cycle of Consciousness, which soon ends. This life will be so long that is even considered that mankind will acquire immortality. Thus, the picture informs about humanity's Transition from the level of the Crystal structures on the Highest level of the material world; reveals the structure of the cells of the individual consciousness and the main law of the Transition – the law of the united consciousness, based on the golden principle of morality – loves your neighbor as yourself. The picture tells about the humanity's Transition from the level of the Crystal structures on the Highest level of the material world. The picture shows three Women. The Woman in the green dress means life on Earth. This way is designated the level of the Crystal structures. She is pregnant. It depicts an endless continuation of life on earth at all levels. Red color of the scarf indicates that she has already received the information about the Transition of humanity on the Highest level. In the center is shown the Woman in the blue dress, the color of which depicts the Highest level of the material world, where humanity has to make the Transition. That is why the Woman in the blue dress is also pregnant. She soon expects the mankind in the future life as a result of the Transition. These two Women are shown side by side, since mankind has to make the Transition from the level of the Crystal structure on the Highest level of the material world in harmony on the same planet Earth, where will continue life. Green color of lining. The future, but very soon, the origin of life on the Highest level depicts colored in green the inner surface of clothes – the lining of the blue dress. This secret of pregnancy reveals only a big belly, lifting the edge of a long Woman' dress. The plume of elongation on the left on the skirt. The plume of elongation on the left on the skirt. Just as in the previous figure 44, the skirt of the blue dress has a small plume on the left, i.e. it is longer than the others. This shows that human life in the new cycle on the Highest level will be longer than today, because humanity will gain immortality. 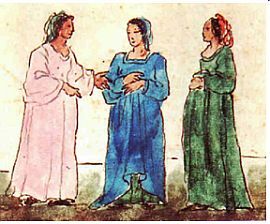 The third Woman in the pink dress depicts information about the Transition, which she tells to the Woman in the blue dress, representing the Highest level. She informs that the consciousness of humanity is ripening for the Transition and continuation of life on the Highest level. This is indicated by a green kerchief on her head, as well as the pink color of the clothes. Collars on dresses. The collar on a pink dress has uncertain form, but on two other dresses – blue and green – the collars are rectangular or U-shaped. On the one hand, it indicates on the fourth level of consciousness of mankind, which is either currently resides or will reside on one of these levels of the material world. On the other hand, U-shaped collar – it's a crescent of the united consciousness. So is shown a base of information about the Transition, transmitted by the Woman in a pink dress. The picture reports that mankind living in the individual mode of consciousness, shown by standing alone «Woman in Black», expects hard times – the incredible sufferings and deep mourning, indicated by the dark color of the house and a black cape. The way to salvation of mankind indicates the Rider on the White Horse – the Woman in tiara and red cloak. The bird, which means the Transition, sits on the Woman left hand leading to the heart. This informs that the basis of the Transition must be the golden rule of morality – love your neighbor as yourself. Four windows, by two on each wall of the upper superstructure of the house, point to the principle of the united consciousness that lies at the heart of humanity's Transition. The Woman in tiara already received the Instructions for the Transition and the two keys to their reading and is excited to announce the need for humanity to make the Transition to another safe level of the material world. The Woman in tiara turned her back to the woman in dark clothing with individual consciousness and went away, because her goal – unification of consciousness of civilization for the Transition. However, hands folded together of the Women in black, skin-tight head hoop, put on top of the kerchief and two of its going down ends, and also wrapped up at the bottom of the skirt a triangular piece of tissue that divides it into two parts, are the elements of the united consciousness. So shown that the misery and losses that will cause deep mourning, will force mankind to change its position and combine the individual consciousness. The number of the Beast 666 warns about deadly danger for the Transition of deep individual consciousness of humanity caused by very broad and extremely rigid boundaries of cells of all people in the world. So is manifested carbon basis of our life. Nostradamus predicted that in the period of the onset of global cataclysms will arise a new religion that will save humanity. The Woman in the papal tiara and a red cloak sitting on the two-paws' Snake-cataclysm with a long tail, shows that the new religion, which she transmits about humanity's Transition into a new cycle of life through the united consciousness, and the Snake-cataclysm, with a long tail are connected, as a unit. Moreover, this doctrine has arisen in connection with the beginning of global cataclysms, and it will enable mankind to curb them – says the picture. However, mankind will not fight with them in an unequal battle. Relying on new doctrine, received by the Woman in tiara from the Above, mankind will overturn consciousness from hate to love, and thus, will expel the Beast. As a result, mankind will make the Transition on the Highest safe level of the material world. The tiara on the head of the Woman means that she has already received the Instructions for the Transition, written in symbols of consciousness, together with two keys to read them. The Instructions inform that for the Transition on the Highest level humanity has to ignite a laser beam, depicted as a sword in the hands of the Woman. However, the action of the united consciousness of humanity is too weak because of imperfections. In order to incredibly strengthen this action, by causing a laser beam of incredible power, it is necessary that the united consciousness of humanity sets up homogeneous resonant structure. To create this structure, on the one hand, is very easy, but, on the other hand, is incredibly difficult. It is easy because humanity is only required to show a deep love and understanding for each other. However, this deep sense of love and compassion is very difficult, almost impossible to cause of hard hearted humanity because of the broad cell borders of the carbon nature. This feature of human consciousness manifests in wars, terrorist attacks, etc. St. Peter, to pay close attention of humanity of this essential condition for the Transition and salvation from cataclysms in the kingdom of heaven, he wished been crucified upside down. This fabulous case entered the century, but still has not been understood by mankind. The solution of his great extraordinary decision to warn mankind and thereby save civilization from destruction in global cataclysms came just today before the Transition. Through his act, he warned mankind of the mortal danger of default of the conditions for the Transition. He urged humanity to overturn consciousness, replacing hate on love and understanding! Love should cover all of humanity regardless of ethnicity, religion, color of skin, age, gender, etc. and melt our hearts. We all have a common destiny because humanity is completely tied to the planet Earth, on which will soon begin global cataclysms. It is only on our joint efforts depends the continuation of our lives. This decision of the people of the Earth about the relations, based on the golden rule of morality – Love your neighbour as yourself, fears the Beast to neck of which the Woman put the blade of the sword. A firm decision of mankind to overcome his nature and light laser beam for the Transition terribly frightened the beast, which by surprise even stood on his hind legs and quickly ran away. However, the Beast turned around to see how this decision of humanity is firmed. Thus, Nostradamus has shown that the doctrine of the Transition will overturn the consciousness of humanity from hatred to love and help to overcome the main obstacle to the unification of consciousness – Number of the Beast 666. In the picture are used analog and digital symbols of consciousness. Detailed information about the number of the Beast human and apocalyptic is disclosed on this website in the article «Number of the Beast 666 – mortal danger for the Transition». There are several drawings depicting the Woman in a tiara with the body, conjoined with the serpent-cataclysm. All these pictures tell about the same period of time - the beginning of global cataclysms and the emergence of a new worldview based on the union of consciousness of civilization for the Transition on the Highest level of the material world into the kingdom of heaven, but from different perspectives. Let's consider the pattern in the center. Two Women in tiara. The picture depicts two Women in tiara. In the center stands the Woman with keys and a bird on them. Below the keys also is depicted the Woman in tiara, but with the body, conjoined with the serpent-cataclysm. She extends the hand to the Woman that stands with the keys. About what inform this picture? First of all, the picture does not depict two Women in a tiara, but the only one. The Woman pictured twice transmits the main and additional information about the same event. Tiara means that the Woman has already received from the Above the two keys for reading the Instructions, for humanity' Transition on the Highest level of the material world – the Kingdom of Heaven, written by symbols of consciousness. Green color of tiara on the Woman with a sword-beam of laser means that information about the Transition will be in demand simultaneously with the onset of cataclysms. The Woman with the body, conjoined with the serpent-cataclysm, reports: the Woman with the Instructions for the Transition of humanity represented by the symbols of consciousness, as well as two keys to read them, will appear at the same time with the cataclysm. The Woman with the keys. Many objects that appear around the Woman reveal her mission on Earth. The keys to the Kingdom of Heaven - are required to read the Instructions for the Transition and the salvation of mankind. The bird – a symbol of the Transition. The bird sitting on the keys and ready to take off reports that these are the keys for the Transition of humanity to the Highest level of the material world – in the kingdom of heaven. Keys with the bird the Woman holds in her left hand, going to the heart. This means that the Transition will take place only if it will be based on the golden rule of morality – love your neighbor as yourself. The sword represents the laser beam, which should cause the united consciousness of humanity, as the manifestation of this action for the destruction of the body, the Transition and the general resurrection in a new cycle of life. The handle of the sword comes out of the Woman' mouth. This means that the Woman is telling about a laser beam, which is necessary to cause by the united consciousness of humanity for the Transition. Edge of the sword rests in the body of the lamb. The lamb represents a uniform medium of united consciousness of humanity required to enhance the action of the united consciousness. Over the head of a lamb is shown a large circle which includes two circles of smaller diameter. So is shown the principle of the united consciousness. The blade of the sword, which rests on the body of the lamb, as well as the cross, which crosses its body on a long handle, inform about the following.For the Transition is required to create homogeneous resonant medium of civilization' consciousness to enhance the action in the form of laser beam which will destroy body. Branch consists of three blocks of leaves – one leave on the left, depicting individual human consciousness; three leaves in the center, showing the three previous levels of consciousness, entering into an individual cell of human consciousness, as well as two leaves on the right, representing the unification of two people' consciousness. Thus, the branch that the Woman holds in her right hand – the hand of action – by the digital code inform about the necessity of unification of consciousness for the Transition. Green color means life. The green color and its shades, in which are colored tiara, the snake, the keys and the upper layer of the cape the Woman, means that information about the Transition will be in demand with the onset of cataclysm. Conclusion. Thus, the work of the Woman with the Instructions for the Transition will start simultaneously with the cataclysm, because just at this time, this information will be in demand. The main figure of the second part is the Woman in tiara. The tiara on the Woman's head means that she received from the Above the two keys to read the Instructions written by symbols of consciousness for humanity's Transition on the Highest level of the material world.Nostradamus informs that the Woman with the keys for the Transition depicted him in tiara, will appear simultaneously with the beginning of cataclysm of incredible strength.The information about the necessity to unite consciousness for the Transition many people will meet «in hostile reception» because deeply individual consciousness preserves its values and basis - private property. However, even the first, the weakest of the three preliminary cataclysms of incredible power, which will lead to big losses of people and the destruction of vast areas, as well as the high level of radiation, will force humanity to change its tough position towards the Transition. Humanity consciously will have to take the only way of salvation given from the Above.